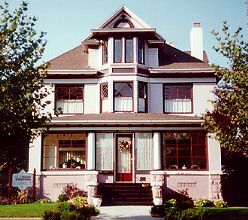 This truly distinctive Queen Anne home is listed on the "National Register of Historic Places". Architectural details reminiscent of the 1900's accent this 3 story brick and sandstone house. Located in Boise's quiet, yet convenient Northend, J. J. Shaw's is within walking distance to fine restaurants, Hyde Park Historical District, and is minutes from the State Capitol, Boise's River and University. For complete quest information, including pictures please visit our Home Page. This and other Boise Bed and Breakfast Inns can be found here in The Register.